Hello lovelies. Lately you may have noticed that I haven’t been posting a whole lot. No, I’m not getting lazy, just the opposite, I have been working really, really hard. This blog is about to get flipped upside down! ..well, not really, that would be hard to read and awkward looking. I have been working on many new features and improved pages for this site, that will be released very soon. Not only that, but I have been making you a free gift! I think you are gonna like this one. 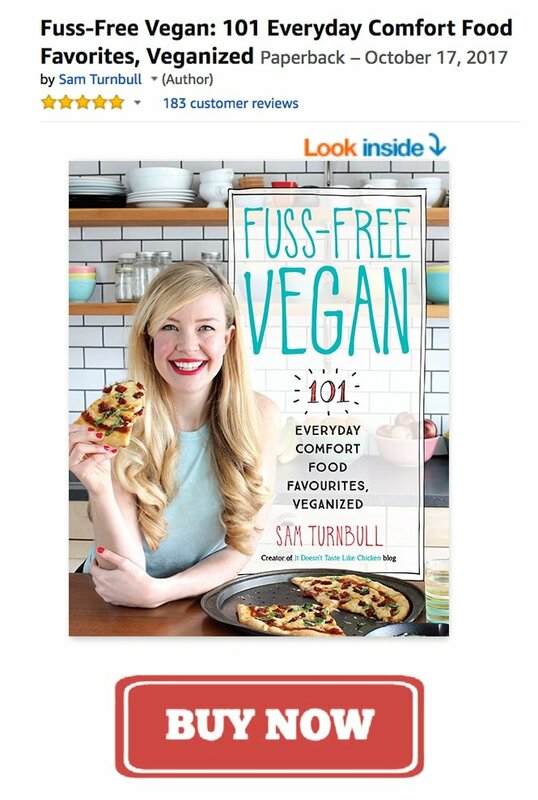 Hint: “Wakey, wakey, vegan eggs, and vegan ………” In the meantime, I am already testing out the new commenting system. Now you can comment using your facebook, google, twitter, or disqus account. If you don’t have any of those, just quickly sign up for a disqus account. Not only can you comment here, but you can keep track of all your comments on this blog, and every other blog that uses disqus, and follow commenters you are interested in. Pretty nifty huh? So what do you think? Try out this commenting system, and let me know if you like it. On to potatoes. Those sweet, sweet orange potatoes. (Apparently I have a thing for orange food this month). We sometimes call them sweet potatoes, we sometimes call them yams, tomayto, tomahto… whatever you call them, they are delicious. 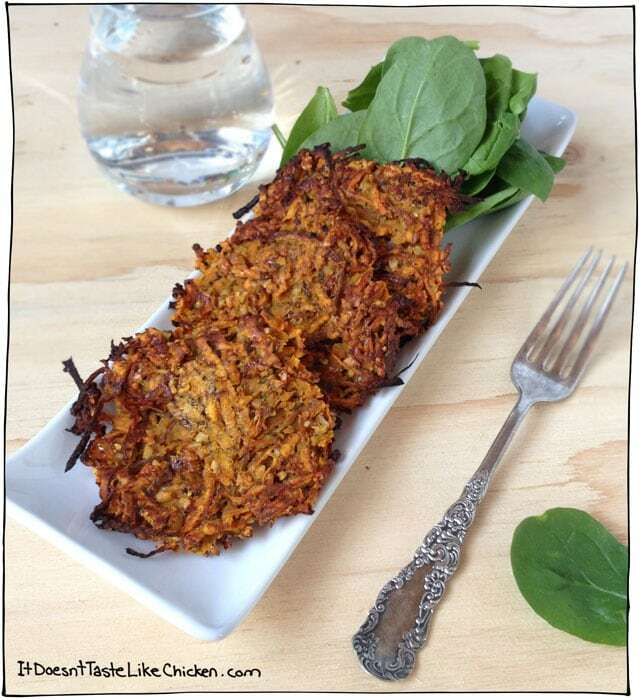 I made up these latke like dudes, one hungry lunch day, not really expecting a blog post type recipe. Then they turned out so yummy, that I had to post this recipe. Even as you mix the ingredients together, heavenly scents rise up from the bowl. I had just popped them into the oven, when my mom arrived. Upon entering my house, a little startled she said “it smells like cheese in here! ?” Don’t you just love it when you get that kind of comment about your vegan food? These can be a tasty side dish, but they are so packed full of flavour, that I would happily serve them as the main! Serve with some veggies, a salad, and your good to go. Preheat your oven to 400F, and lightly grease a baking sheet, or you can use a slip mat thingy. Let’s make a flax egg. 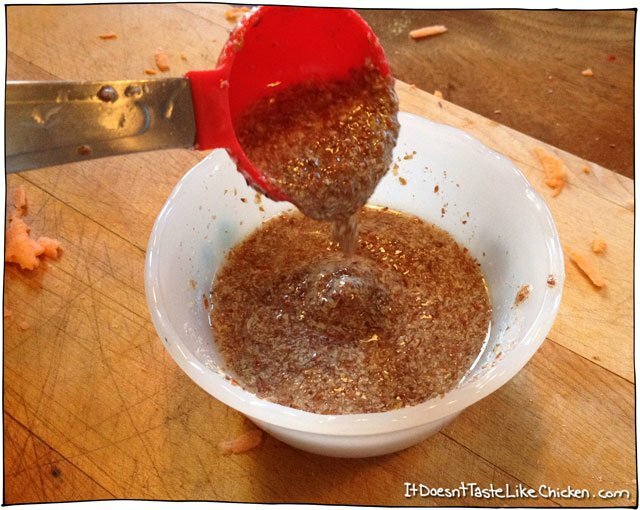 If you are new to flax eggs, never fear, they are very easy. Just measure the flax, and warm water into a small bowl, give a little stir, and set aside. That’s it. Flax has this awesome gel like power and so it will kind of goo up as it sits there. If this is your first time buying ground flax, I recommend storing it in the freezer so it lasts longer. Now onto those sweet suckers. 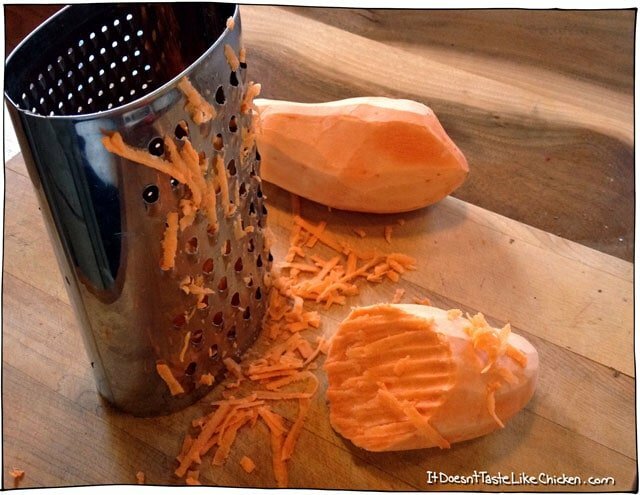 Peel those bad boys, then use the large side of a cheese grater to grate both of the potatoes. 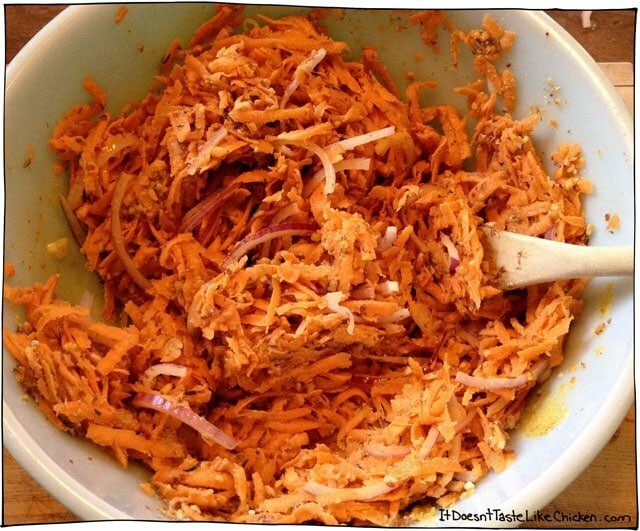 Thinly slice the onion, and then toss the potato and onion into a big bowl. Then just add everything else. 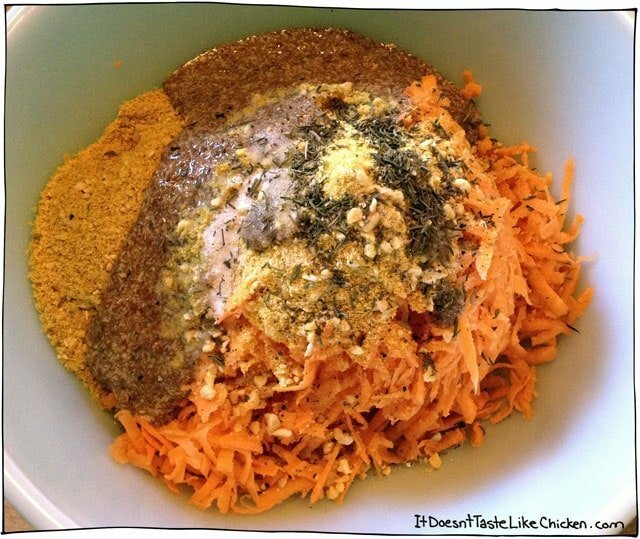 The flax egg, parmegan, salt, pepper, and thyme. Look at that baking sheet… can you tell I use it a lot!? Do you know a way to keep these things looking prettier without heavy chemicals? Please ignore the ugly baking sheet. Spoon the sweet potato goodness onto the pan, and then lightly pat into pancake shapes. Toss in your oven, and bake for 15 minutes. Remove, and carefully flip them. If one falls apart, just kind of pat it back together, then pop them back in the oven for another 5-10 minutes. The edges will get slightly burnt and the tops will be golden. Let cool for 5 minutes before serving. You can serve with vegan sour cream, spicy tomato ketchup, HP sauce (yep, it’s vegan), or just as is. Ooooohhh that sounds like a great thanksgiving breakfast! I´m new to your wonderful blog. I even posted your blog on my favourites bar. I know you are about to change your site but whatever you do don´t change the way you post your recipes with photos..please. 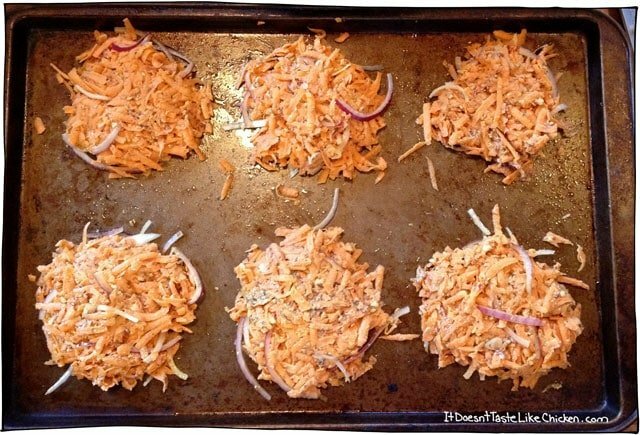 Now I´m on to make the sweet potato cakes. Thank you! Wow, thanks for the lovely compliment! What a nice message to wake up to. I promise, I won’t change the way I post my recipes. I’m really glad you like them just the way they are! 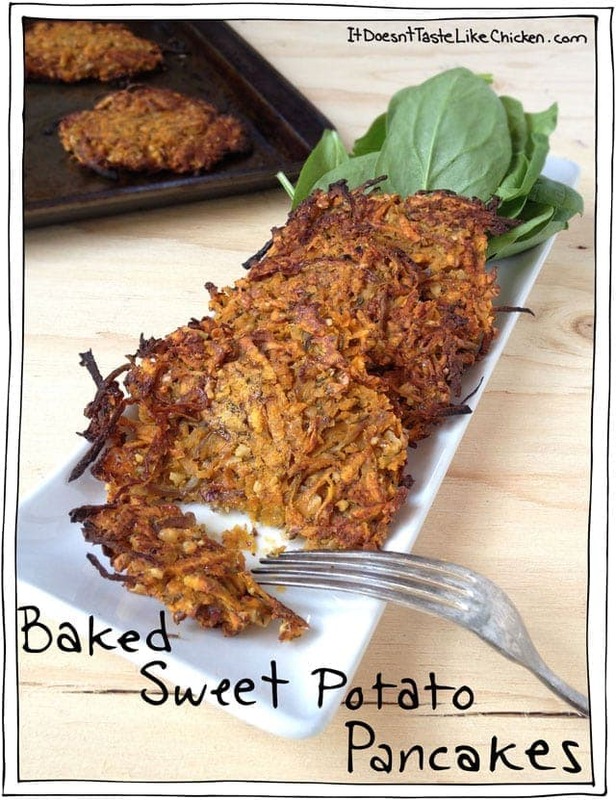 Enjoy the sweet potato pancakes. They are super yummy!… well in my humble opinion. haha. Had them for lunch today. Sooooooooo good! OMG! Thank you! I was thinking this might be a good way to use up my abundance of radishes from the winter CSA. Radishes get sweet when roasted, so…. hmmm…. I’ve never tried them with radishes. Radishes have a higher water content than potatoes, so if you try it, add the radishes as another ingredient, still using your potatoes as a base. If you give it a try, let me know how it turns out! Haha! I see what you did there… very clever. haha. These look and sound great and will be on my menu in the next day or two! I”m really looking forward to seeing your new blog, even if it is upside down. Haha! I can just picture you, craning your neck to read the recipe… Glad you like the sounds of the dish, you requested more side dishes, so here you go!